The World Bank Gets An Overhaul — And Not Everyone's Happy : Parallels The World Bank is undergoing a vast reorganization, its first in nearly 20 years. The process has been controversial, but the bank's president says it's needed to foster better internal collaboration. Jim Yong Kim joined the World Bank as president in 2012. 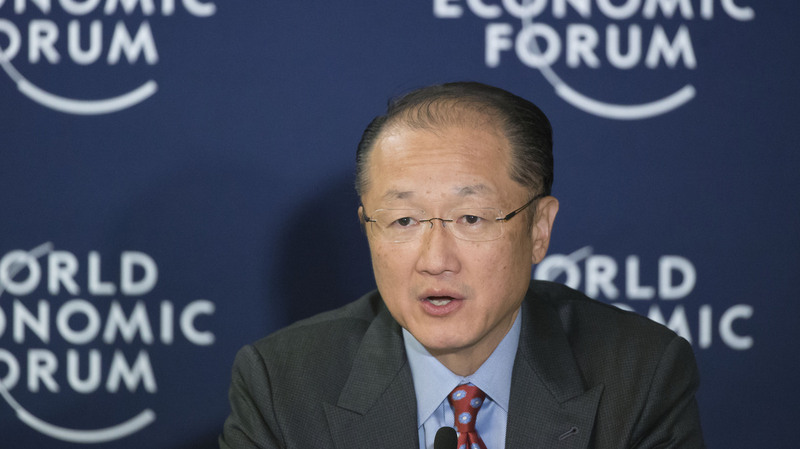 The World Bank, the largest international development institution, is undergoing a sweeping reorganization, the first of its kind for the bank in nearly a generation. The bank, based in Washington, has laid out a new set of goals, but they're accompanied by deep budget cuts and the elimination of a whole layer of senior management jobs. The overhaul is being led by its president Jim Yong Kim. One of the first things the 54-year-old physician and anthropologist did when took office in July 2012 was launch a company-wide survey. He says the majority of the roughly 10,000 employees told him how the bank could be better. "We need to move knowledge more effectively. We need to be more nimble. We need to use our balance sheet more effectively," Kim says. Kim also wanted to find out if employees thought the bank was ready to take on two new ambitious goals — reducing poverty worldwide by 2030 and boosting income of the poorest 40 percent. "The answer that I got back ... was no, not even close. We need to change," he says. So Kim has launched a series of reforms at the bank, which lends up to $50 billion a year to more than 100 countries for projects and expertise for health, education, infrastructure and the like. The budget will be cut by $400 million over the next three years. And Kim is changing the organizational structure, which has traditionally been split up into regions of the world, with separate budgets and management. Kim says he wants break down those silos and have better collaboration across the organization. He's created something called Global Practices where experts in various fields will apply their knowledge across the world, rather than in one area such Africa or Asia. "So health people were scattered all over the institution, education people were scattered all over the institution," he says. "We're going to bring them together." Some, even within the World Bank, are applauding the overhaul, saying the organization for years has groaned under the weight of bureaucracy and redundancy. But for others, the changes have all the subtlety of a chainsaw. Several employees, who did not want to go on record for fear of retribution, tell NPR that a climate of fear is permeating the bank. Paul Cadario, who was a senior official at the bank for nearly four decades, says that's because Kim has handled things badly. As an example, he points to the unexpected departure of two senior officials early on in the reorganization. He says they had more than 50 years of World Bank experience between them. "Certainly the way it was done was crude, was hasty and was never really well explained, which in any organization is going to lead to rumors," Cadario says. That isn't helpful if you're trying to change a culture to make it more open and trusting, he says. Kim is eliminating a whole layer of senior managers — more than 50 people. Their jobs will be gone by July 1. Kim says they can apply for other positions, including newly created ones in Global Practices, and that the bank is committed to keeping all its top performers. But he says the bank will open up positions to outsiders, because it's good to bring in fresh eyes. Scott Morris, a senior associate at the Center for Global Development, says there's no question Kim's changes are controversial. "I think what you would find President Kim's critics and fans agree on is that he is a disruptive force in the organization," says Morris, a former U.S. treasury official who was responsible for U.S. participation in the World Bank and other development banks. Morris says one of the things the World Bank is grappling with is its place in international development. Many of the poor countries it helped for decades are now middle class and have access to different streams of funding. Morris says there are other big international aid agencies out there, including the Bill and Melinda Gates Foundation, crowding the field. "And the question for the bank was, does it continue on its current path and become less and less relevant to its client countries, or does it launch ... some kind of change to make sure it continues to be relevant," he says. Morris says Kim likely laid out his plans while campaigning for his job, and he does have the endorsement of the board of governors and the more than 180 member countries. Kim says he feels empathy for the employees' anxiousness but that is not going to slow things down. "I believe though that if you know changes should be made, you should make them," he says. If there's some sense that changes are going to be difficult so they should be stretched out over five years, he says, "that never works." The reorganization, including new leadership, will be finished by July 1.